Dilmanc Mobile Translator allows you to translate speech, text or separate words between Azerbaijani and other languages. You can also listen to translated text via Text-to-Speech feature. When entering single word, program also shows dictionary translation, part of speech, synonyms and other information. In Dilmanc Conversation mode, speech-to-speech translation tool activates to allow you to interact with foreigners. Submitted by admin on 31 May, 2013 - 15:23. Submitted by admin on 3 April, 2013 - 11:59. Dilmanc has released the new version of online Text-to-Speech system. This version includes fixes related to intonation, and better voice tone in interrogative sentences. We are working on the development of new versions of system, also adding new voices. Submitted by admin on 7 November, 2012 - 10:57. 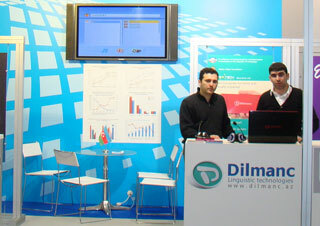 Dilmanc project has presented a lot of new products this year at BakuTel 2012 exhibition. The speech recognition system for Azerbaijani language which was presented at the exhibition enables to enter the text via dictating to microphone. Instead of typing with a keyboard it is possible to convert speech into text via this system. Input speed of the program is 3-4 times faster than typing in a keyboard and the program also allows disabled people who have difficulty in typing with a keyboard or people with visual disabilities to input a text via dictating. Currently the system is able to recognize , more than 160 thousand word-forms and the quality of the system is over 91%. The system will be released at the end of 2012. Another new product presented at the exhibition is the Text-to-Speech system for Azerbaijani language which reads input texts with human voice. This program enables users to input text in Azerbaijani language and listen to synthesized speech. The system was released at the official site of the project (http://tts.dilmanc.az) and currently is very popular among users. Submitted by admin on 14 September, 2012 - 15:33. Change Voice Speed option has been added to Dilmanc TTS. The new feature which was added to the system allows to adjust playback speed. Note that, Dilmanc text-to-speech system was released at the begining of this year and works on development of new versions of the system are continued. Submitted by admin on 7 September, 2012 - 12:36. 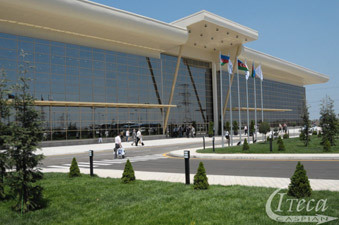 Azerbaijani-English and Azerbaijani-Russian directions of Dilmanc online dictionary are now available. Note that only two - Russian-Azerbaijani and English-Azerbaijani directions of Dilmanc online dictionary were available. Like previous version, this dictionary also allows to search not only word roots, but also any word-form. Also, it is possible to translate any word-combination or whole sentence, word by word. At the same time the word database of the dictionary was updated. Note that, the first version of online dictionary was avialable at the beginning of this year. Works on improving quality and adding new directions are continued. In addition, the word base of dictionary has been updated. Note that, Russian-Azerbaijani and English-Azerbaijani translation modules of Dilmanc Online Dictionary were available at the beginning of this year. The main difference of this dictionary is that Dilmanc online dictionary translates not only word roots, but also any word-forms. Activities on improving quality and adding new directions are continued. CeBIT is the world's largest trade fair showcasing digital IT and telecommunications solutions, from 6 to 10 March, 2012 in Hanover, Germany. Trending topics identified by leading thinktanks - Big Data, Cloud Computing, Mobility and Social Media - are the focus of the upcoming event, under the overarching theme of "Managing Trust - Trust and security in the digital world." More than 4200 companies from 70 different countries take part in this exhibition. 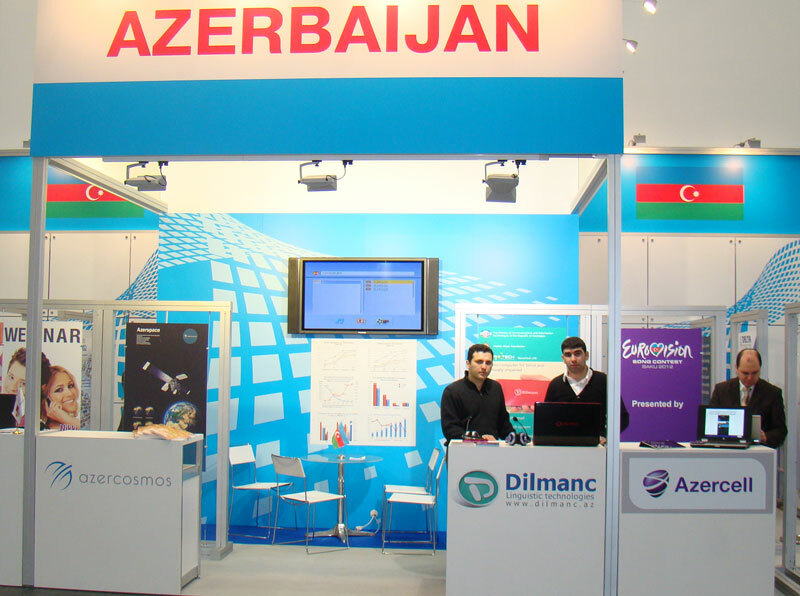 Dilmanc project demonstrates the mini computer which was developed for blind and visually impaired people and telephone translator which translates telephone conversation from Azerbaijani to English, Russia and vice versa, also the speech recognition system for the Azerbaijani language in the exhibition.